The Covington County Emergency Management Agency would like to remind citizens that the first WEDNESDAY of EVERY MONTH the OUTSIDE WARNING SIREN system will be tested. This test will include the OUTSIDE WARNING SIREN sounds and is conducted for the purpose of ensuring operational fitness for public safety. 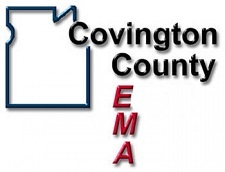 The Covington County EMA would like to thank the citizens of Covington County for their continuing cooperation in all EMA matters.